El Dia de los Muertos, or Day of the Dead, is an important Mexican festival where it is believed dead souls return to earth. The festival takes place over three days; on October 31st the souls of dead children, los angelitos, return. The children stay with their families until the afternoon of November 1st when they must leave to make way for returning adults. On November 2nd some people dress in skull masks and run around their towns to chase lingering spirits back to the land of the dead for another year. A Mexico tour will bring travelers into contact with a culture which is more accepting of death. The Day of the Dead festival can be traced back to the Olmec civilization. The festival was also part of Aztec culture and the use of skulls to symbolize death was a major element of the proceedings. The Aztecs also separated the focus on the souls of children as in the modern day festival. After Mexico was conquered by Spain in the 16th century Catholic priests were horrified by the colorful and joyous festivities which appeared to mock death. Authorities decided that the festival should be wiped out however it soon became apparent that it was impossible to repress it. The Spanish decided to combine the Mexican celebration with the Christian All Saints Day and All Soul’s Day, moving the time of the festival accordingly. In the month leading up to the Day of the Dead festival and particularly in the last week of October markets and shops sell themed items and treats such as calacas. Calacas are skeletons, often presented in humorous poses. Death themed decorations and sugar skulls are ubiquitous in markets at this time. The term calaca can also refer to masks which are worn during the festival or hung up as decoration. The term calaveras can refer to different depictions of skulls and skeletons such as La Calavera Catrina. Mexican artist Jose Guadalupe (1852 – 1913) produced a satirical drawing of a skeleton in expensive female dress to show that the rich could not avoid death. La Catrina features in much of the art and costumes surrounding the festivities. Families will decorate an altar or ofrenda in their home with flowers, candles and reminders of dead relatives. Food and drink such as day of the dead bread (pan de muerto) and tequila are also placed on altars. Families visit the graves of their loved ones, they fill cemeteries with marigold flowers which are thought to draw and guide the dead. Sometimes trails of flowers are spread between a grave and the family home so that the relative can find their way. Some families spend the whole night in the cemetery with their loved ones. 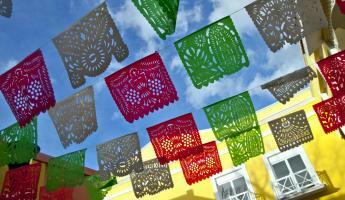 Mexico travel breaks are greatly enriched by experiencing this famous Dia de los Muertos festival. For some the concept of being accepting and even joyful about death can be confusing. Seeing cemeteries glowing against the night sky with hundreds of candles lit to attract departed souls allows visitors to experience a new way of thinking about death and the dead. Plan your Mexico tour to coincide with this festival for a unique cultural experience.